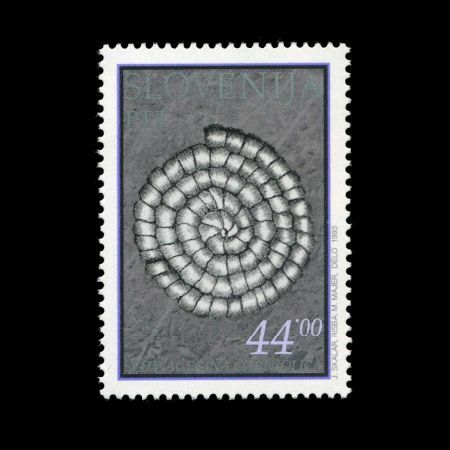 Slovenia 1993 "Fossils of Dolzan Gorge: SCHWAGERINA CARNIOLICA"
On May 7th 1993, Post Authority of Slovenia started a set of "Fossil of Slovenia" . 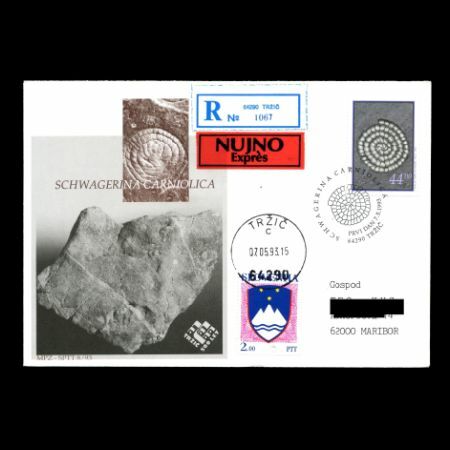 The first stamp of the set shows SCHWAGERINA CARNIOLICA. The world known palaeontological locality in the Dolzan Gorge above Trzic offers to the visitor an inexhaustible wealth of various Lower Permian fossils. Solely the brachiopods amount to about 80 distinct species, and among these more than 20 species are new, first discovered and described from this locality. Extraordinary is also the richness of large foraminifers, several of which were first found here. 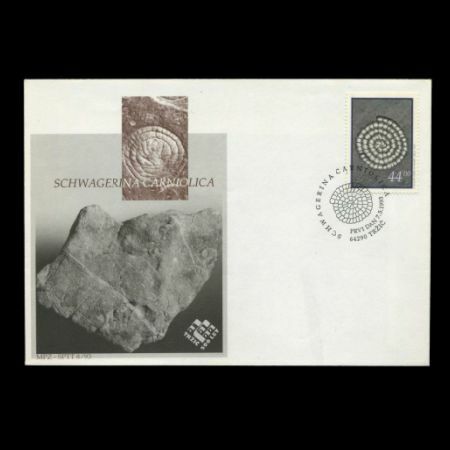 One of these fossils is the sphaeric fusulinid Schwagerina carniolica (Kahler & Kahler) - the Carniolian Schwagerina which was discovered in black limeston at the second turn of the road in the Dolzan Gorge, and described as new species in 1937. Its test is a bout 9.5 mm long and 8 mm wide. The animal lived about 280 million years ago, at the time when in the warm ancient sea the Lower Permian Pseudoschwagerina limestone was deposited.